Item # 140583 Stash Points: 17,995 (?) This is the number of points you get in The Zumiez Stash for purchasing this item. Stash points are redeemable for exclusive rewards only available to Zumiez Stash members. To redeem your points check out the rewards catalog on thestash.zumiez.com. The Cannon All Gold and Black watch is a simply stated design with clean lines that offers a refined look perfect for any occasion. This Nixon timepiece is featured in an all gold stainless steel high-profile case and a matching tapered 3-link band that is incorporated into the case to eliminate swing. 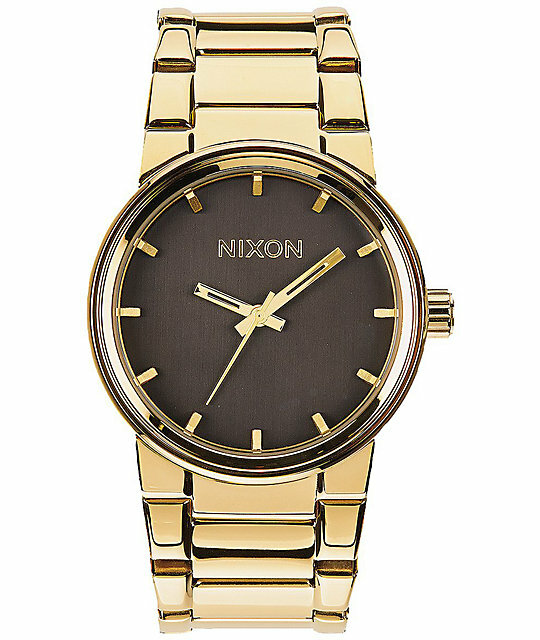 The case and the band are contrasted by a black colored face that showcases gold accents like the stainless steel indices, custom molded hands and Nixon logo detailing. Cannon All Gold and Black watch by Nixon. 39.5mm solid stainless steel case with hardened mineral crystal display. 100 meter / 10 ATM water resistance. Triple gasket stainless steel crown at 3 o'clock. 26-23mm tapered solid stainless steel 3-link band. Double locking clasp closure with micro adjust.